Most issues of Radical Teacher are defined by a predetermined theme, and are overseen from conception to completion by a group of editors (one or more from the RT Editorial Collective, occasionally with an outside editor or two) who are ultimately responsible for the issue’s content (with feedback from blind reviewers who are drawn from the collective). At the same time, RT accepts “over-the-transom” submissions on a rolling basis that are not targeted for a themed issue. These essays are overseen by us (the Manuscript Editors), and when enough of them emerge from the blind review process with positive feedback, we group them together in a non-themed issue such as the current one. 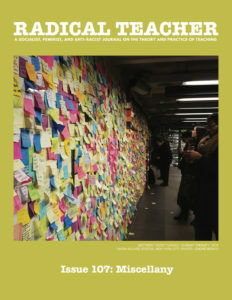 In a sense, however, even these non-themed issues have a theme that is articulated by the subtitle of Radical Teacher, which explains that we are a “socialist, feminist, and anti-racist journal on the theory and practice of teaching.” To that extent, the articles in these issues share a commitment to liberatory politics and a belief that teaching and scholarship can help define and implement those politics. Sometimes the essays published in these “miscellanies” are more directly connected to past themes because authors send us essays that were inspired by their reading from past issues or that were in fact submitted for past issues but not revised in time to be included with other essays on that theme. And surprisingly often we receive essays that anticipate future themes because there is a groundswell of interest in a particular topic among radical teachers in general. The essays in this current issue fit all of these categories, and one other: a reprint of an essay spotted by a member of the Editorial Collective who felt that it fits with our interests, with an introduction by one of us (Michael) explaining why we thought it would be of interest to readers of Radical Teacher. The last time we two Manuscript Editors worked together on a themed issue, it was on “Environmental Education” (Vol. #78), an aspect of which was revisited in a more recent issue on “Teaching about Climate Change” (Vol. #102). We were struck by how Nancy Dawn Wadsworth’s “Awakening the “Walking Dead”: Zombie Pedagogy for Millennials” would have been a welcome addition to either issue. Wadsworth’s essays lays out the pedagogical benefits of using popular zombie productions, particularly AMC’s The Walking Dead, to teach a critical introduction to modern political theory focused on climate change. Based on Wadsworth’s undergraduate course “Political Theory, Climate Change, and the Zombie Apocalypse,” the article outlines how The Walking Dead can be used to critique the mythic assumptions built into modern social contract theory; to introduce other political ideologies, including conservatism, anarchism, fascism, and communism; and to consider the political challenges raised by a global problem such as climate change in an increasingly neoliberal environment. Zombie productions are offered as a particularly salient pedagogical tool that can help awaken critical political analysis for the Millennial Generation. Cara E. Jones’s “Transforming Classroom Norms as Social Change: Pairing Embodied Exercises with Collaborative Participation in the WGS Classroom” is reminiscent of a series of issues RT has published since its very beginning on feminism, Women’s Studies, and gender (trans and otherwise). Jones’s essay explores tensions between critical feminist pedagogy and the neoliberal corporate university, asking how engaging the body and redistributing student agency highlights larger questions of power that haunt the academy as a whole. Including specific embodied exercises used in Women’s and Gender Studies (WGS) classrooms, this essay argues that as students and professors engage within an increasingly corporate university system, activities that incorporate the body as a site of learning and critical analysis can access situated knowledges while projects that de-center power and responsibility are viewed with skepticism. Jones attributes this discrepancy to the neoliberal structure in which we teach and learn, arguing that we need to value and make visible the labor that goes into critical pedagogy. Jeanne Scheper’s “Mortgaged Minds: Redlining Public Higher Education” could easily be slotted in RT’s next issue on Critical University Studies (CUS). CUS asks teachers and students to not just think about what they are studying but about the contexts in which they are studying it. CUS is about making the means of academic production the subject of academic investigation. Scheper argues that while undergraduate student loan debt continues to be “hard to register,” there are other conditions and effects of the student loan debt spiral that remain relatively invisible, unexamined, and certainly receive less attention in news headlines or on the op-ed pages about the fiscal cliff of education debt. These are the effects of this debt spiral on graduate education, faculty composition, and knowledge production itself. This article asks students, teachers, and other readers of RT to think about how the debt load of faculty is part of the current student loan debt spiral, yet its effects on the working conditions of faculty, the learning conditions of students, and, importantly, the production of knowledge in the university remain underexamined. The final essay published for the first time in this issue, Robert Cowan‘s “ACDC Agency: Food and Politics with Community-College Students at Vassar” was initially submitted for our themed issue on the Food Justice Movement (Vol. #98). We are pleased to publish another contribution on this urgent issue. Cowan taught a course entitled “Feast or Famine: Food, Society, Environment” as part of a program at Vassar College that is a sort of academic boot camp for community college students who hope to transfer to an elite liberal arts college, a Research I university, or an Ivy League school. It’s a full scholarship program during which they take two courses in five weeks, each team-taught by a community college professor and a Vassar professor. The course that Cowan co-taught for two summers with the Chair of Environmental Studies at Vassar provided a survey of issues concerning food systems, such as industrial farming, the role of agricultural lobbyists in Washington, overfishing, food sovereignty in developing countries, food stamps, food deserts, the USDA, FDA, WTO, IMF, etc. Cowan’s essay describes the course and analyzes the irony that with all of the knowledge the students were gleaning from authors like Marion Nestle, Michael Pollan, Wendell Berry, and myriad others, they were fed some of the worst corporately outsourced food imaginable. Cowan argues that this odd juxtaposition raised important questions for the students about how they develop a sense of personal agency—a question that is important both for the food justice movement and for the students’ transition from community colleges to schools like Vassar. Last but not least is the essay we are reprinting by Sohaila Abdulali entitled “Why Toilets are About Class and Gender Wars.” Most of the essay is drawn from an interview that Abdulali conducted with Professor Ghazal Zulfiqar concerning a class she taught on “Women and Policy in Pakistan” at Lahore University of Management Sciences (LUMS). Zulfiqar and her students focused in part on “the toilet as a political sphere,” which became the topic of a presentation that they made to the Human Rights Commission of Pakistan. The introduction Michael wrote to this essay explains why we felt that the issues Abdulali raises about this unit of Zulfiqar’s course provide important models of radical teaching in action. While all these articles could comfortably find a home in various other issues of Radical Teacher, we think they also speak to each other. All of them consider what happens when a teacher helps students reframe and reimagine social and economic conditions they assumed were fixed and permanent, and outside of politics: student debt, the production and consumption of the food we eat, how students are embodied or disembodied in the classroom and in their everyday lives. They share the assumption that undergirds a radical political practice, that the classroom is always engaging with ideology and culture, and it is our responsibility to make that engagement explicit and show how power operates. This issue is the twelfth since Radical Teacher became an online open access journal in 2013. There were many reasons we changed from a print journal to an online one, but among them was our hope that this format would allow for greater transparency and interaction with our readers. We hope that you will join us in this effort by sharing your thoughts with us on Facebook and/or via the blog that is attached to our new webpage. Please join us on these platforms (and stay tuned for a possible relaunch of our Twitter feed) and spread the word to help us expand our media presence. We are heartened by the fact that we have heard from more of you and received more “over the transom” essays since switching formats; we foresee more “miscellany” issues in the future. Please feel free to share your thoughts and work with us as we continue to expand Radical Teacher’s reach during a time when our mission is more urgent than ever.